Place chickpeas in a large bowl (big enough for them to quadruple in size). Cover with water by an inch or two. Soak overnight or for at least 8 hours. 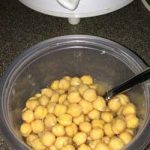 Drain and rinse chickpeas, then place them in a slow cooker along with the bay leaves. Cover with fresh water about an inch above the level of the chickpeas. If you are using fresh herbs, cut sprigs into 3-inch lengths, wrap them in kitchen twine or cheesecloth (or both) and add to slow cooker. Cook on HIGH for 1 hour, then reduce heat to low and cook for 7 to 8 hours. If you prefer firmer chickpeas, cook on HIGH for 3 to 4 hours. Cool, discard herbs if you used them, then store the chickpeas in their liquid in the refrigerator. Substitute these chickpeas in any recipe calling for canned chickpeas. Freeze 1½ cup portions and use them whenever a recipe calls for a 15-ounce can of chickpeas.